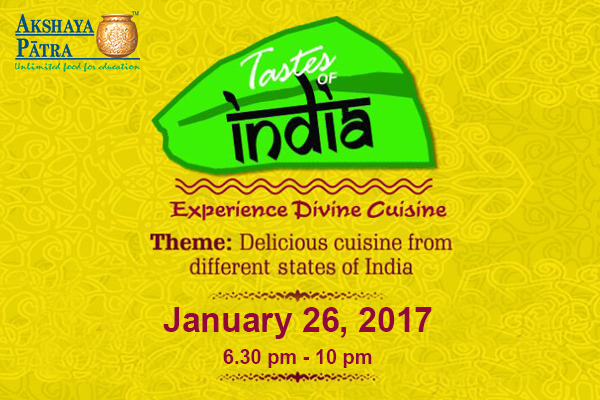 Cuisines from the different regions of India converge at Bhilai this Republic Day (January 26, 2017), at Tastes of India – the annual food festival in aid of Akshaya Patra. The festival will have vegetarian delicacies from the states of Uttar Pradesh, West Bengal, Chhattisgarh, Gujarat, Karnataka, Kerala, Maharashtra, Odisha, Punjab, Rajasthan, Tamil Nadu and Andhra Pradesh. It will be held at Akshaya Patra Campus, Old Dairy Building, Behind Gurudwara, Sector – 6, Bhilai – 490006, Chhattisgarh, from 6.30 pm to 10 pm. We invite you to come celebrate the rich diversity of India with delicious dishes and support Akshaya Patra and its cause of Food for Education!